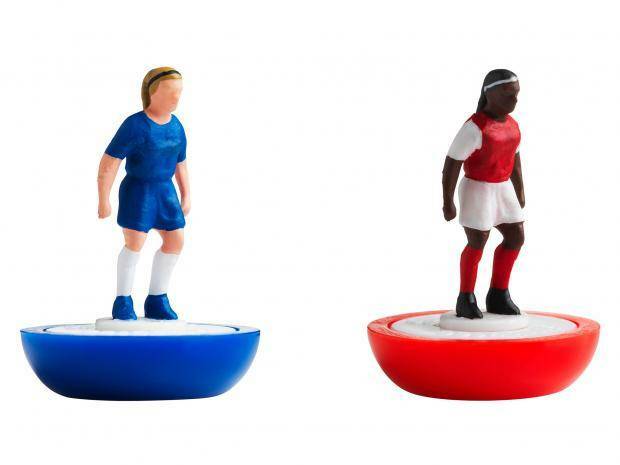 This new, all-female Subbuteo set is a reflection of the rapid growth that women’s football is seeing in the UK right now. It is? Does anyone still play Subbuteo? We aspire to greater equality all the way from board games to boardrooms, and every day we are striving to transform the future of the women’s game on and off the pitch. We are incredibly excited to work with the FA to place focus on female footballers in this special edition of Subbuteo. Subbuteo has a rich heritage that reflects the nation’s love of football and this all-female playset is recognition of the vital role that women’s football has in our culture. This is a little undermined by the fact that the set is not being offered for sale. You can only get it via competitions on the FA’s social media channels. The feeling is that Hasbro and the FA see women’s football not as a viable sport, rather as an opportunity to blow their own horns about equality, and that ‘women’s football’ is something apart from ‘football’.